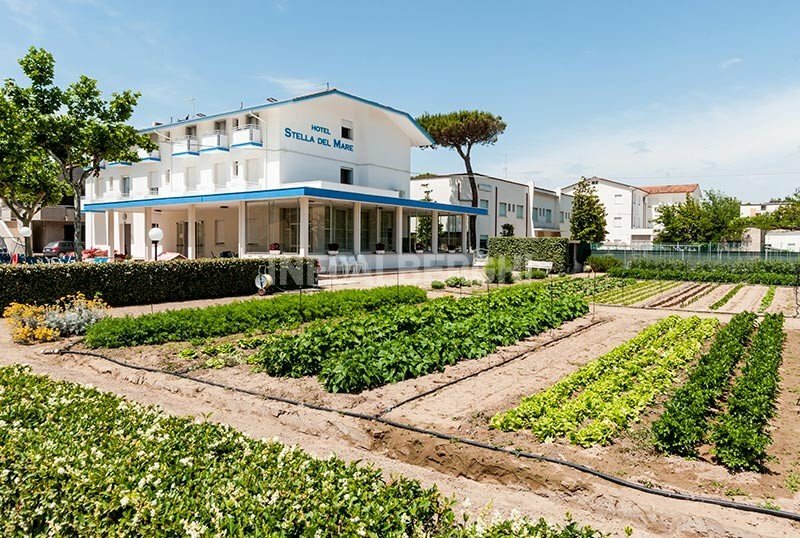 Hotel Stella del Mare is a 2-star hotel in Bellaria Igea Marina, managed by the Angeli family since 1968. Large garden, entertainment for young and old, culinary service with the use of products grown in the garden of the structure. Available services for disabled people. Animals are not allowed. The hotel is located in Bellaria Igea Marina, in a quiet area just a few steps from the beach. Balcony with sea view, digital TV, safe, WI-FI, air conditioning, beds with slats and latex mattresses, private bathroom with shower and set of courtesy, hairdryer. Possibility of breakfast served in the room. Garden of 4000 square meters, open-air porch, terrace, free use of bicycles, lounge bar with satellite TV and Sky, elevator, reading room with newspapers, entertainment with theme nights. PARKING: covered and illuminated until exhaustion, discovered for everyone in the hotel. Available garage for bicycles and motorcycles. SERVICES FOR DISABLED : entrance with inclined ramp, standard elevator, room with wheelchair maneuver, wheelchair access shower. BREAKFAST : sweet buffet, on request. LUNCH AND DINNER : choice between two menus based on meat or fish with homemade pasta and desserts, inspired by the Romagna tradition. Buffet of vegetables produced by the hotel's vegetable garden, located in a position adjacent to the structure. Water, wine and soft drinks included in the all-inclusive formula. In the hotel: indoor and outdoor playground area, strollers, bicycles with approved seat, weekly entertainment with games and visits to the vegetable garden, bottle warmer, pediatrician. At meals : table seats and baby food preparation, free access to the kitchen for mothers. Hotel Stella del Mare has an agreement with the Bagno Andrea n. 95, a few meters from the structure. The prices are per day, per person in full board for min. sat of 3 days. Special week on the 2 June Bridge. From 01 to 08 June, in full board, € 280.00 per person with all the comforts of our structure. In All Inclusive Treatment € 350.00. Request availability and a quote.